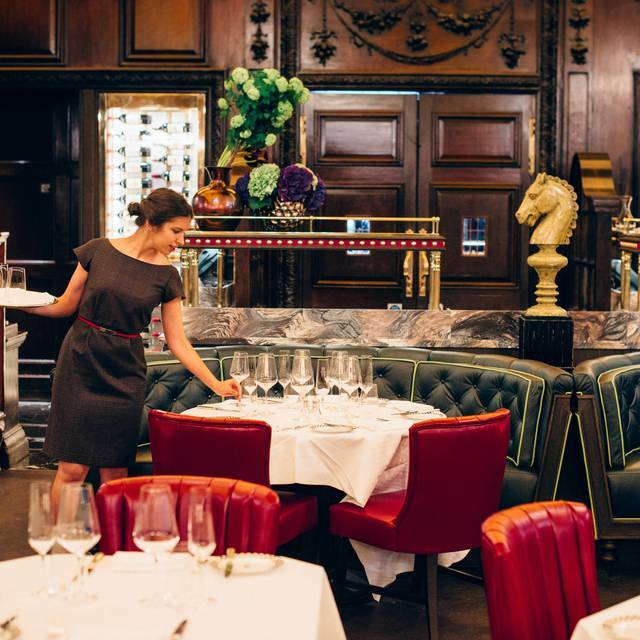 You must make bookings at least 5 minutes in advance of the time at Simpson's In The Strand. 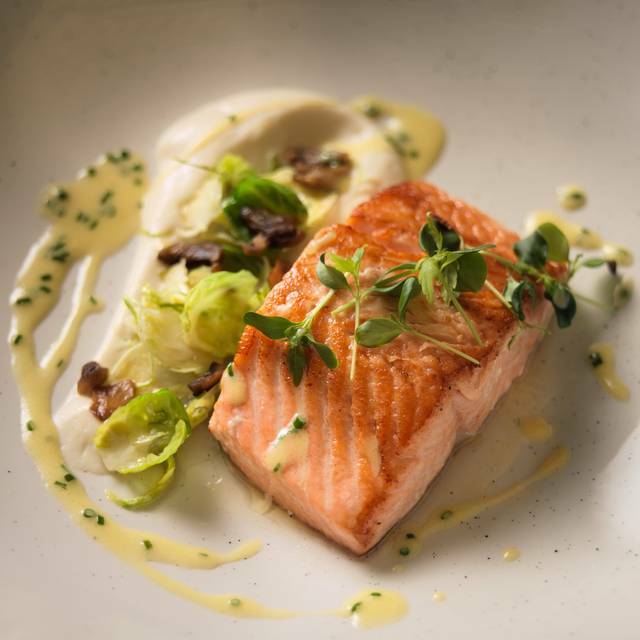 Simpson's is one of the few London restaurants offering only the finest quality British ingredients cooked to perfection in classic British style. The restaurant's speciality is Scottish beef on the bone that has been aged for 28 days for maximum flavour. 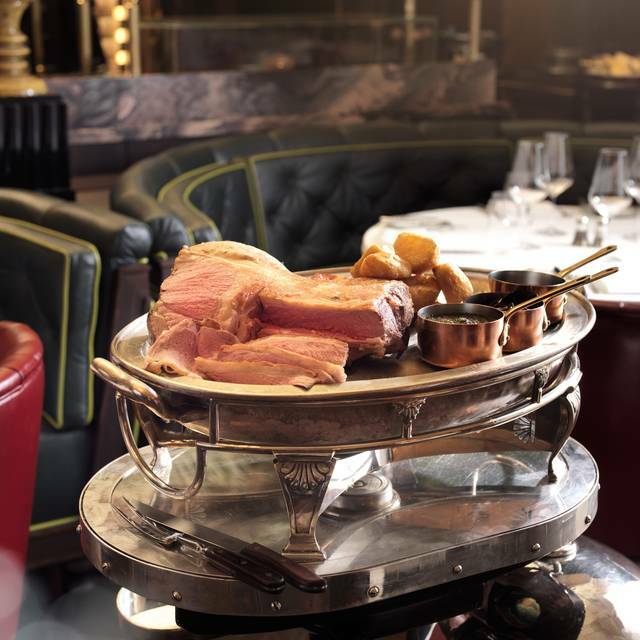 The beef is carved at guests' tables from antique silver-domed trolleys, which is a practice that began over 150 years ago and for which Simpson's is world-renowned. 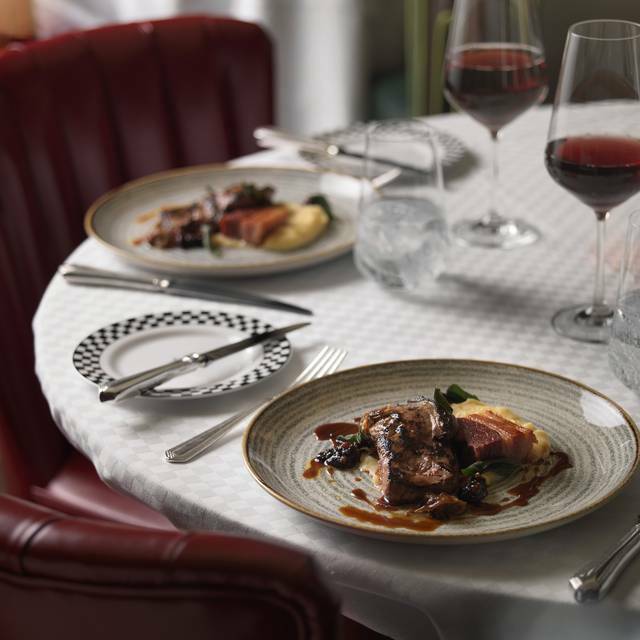 Other Simpson’s signature dishes include classics such as potted shrimps, roast saddle of lamb and steak and kidney pie. 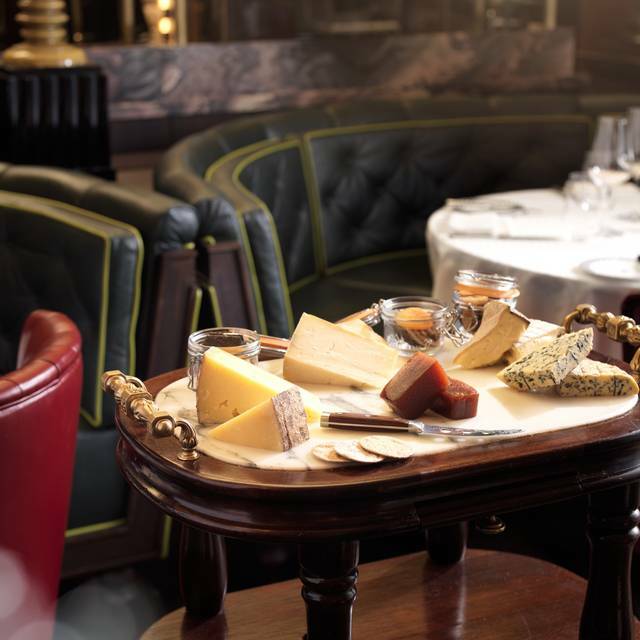 Guests can also enjoy classic cocktails in Knight’s Bar, an art deco cocktail lounge located on the first floor. It is the perfect place to enjoy either a pre-dinner cocktail or after-dinner aperitif. A nice venue and good service, however the food in my opinion was really average at best. I'm all for spending money on great food, but £32 for a sirloin steak that wasn't cooked properly, or £5 for literally 7 chips just shows how pretentious this place really is. No real quality for the prices you're paying, just charging well above the standard prices but failing to deliver the right quality, hugely dissapointint. I would reccomend people visit Bob Bob Ricard which is a similar priced menu, but far more impressive food quality. Sorry, I'm not one to leave negative reviews, but can't help but feel I wasted £180 for an average 3 course meal for two. My husband and I were celebrating our 43 anniversary, at this iconic beloved restaurant and we were so disappointed. We had one night in London and we wanted to revisit the same restaurant where we had honeymooned. We arrived at 5pm to a very unprepared staff that could not attain any rhythm in service. It was not worth the time or money. Excellent food and service . Both the lamb and beef was perfect ! Service was exceptional but I felt very let down by the food. I had the dressed crab to start which was bland. For main I had the beef Wellington but the meat was tough and the pastry underdone. Meal for 2 birthdays and it failed to impress. Cocktails and Oysters first and then a 2 course meal that was delicious. It was a wonderful prelude to a show weekend. Out of town looking for a great experience and found it! The 4 of us had a marvellous experience combined with a truly magnificent meal (we all had the roast trolley). And all this, set in a really atmospheric surrounding with great service. Thank you, I'm sure I will visit again one day. The best culinary experience of my life! The food was superb, fabulous wine and the staff were attentive, knowledgeable and obviously well practiced in their trade. A superb evening and I can’t wait to go back!! It was not as good as it use to be. The carving cart food was luke warm and the pudding was tasteless. Still a great place to enjoy English food. Recommended for my wife’s birthday. It did not disappoint. Everything was exceptional. The food was delicious, the service was friendly and it was lovely listening to the piano being played. Such a treat for chess fans! Worth the trip to London just to eat at Simpson's. On this ocassion the service was impeccable - couldn't fault it. A very enjoyable lunch in excellent setting with very good staff and first class food and wine. Great to see the old place lives up to its history, post its reopening. Lovely atmosphere, Good food, Good service our first visit but will go again. Celebrated a friend's birthday had a wonderful time and staff were very pleasant. Very nice evening indeed, service is second to none and food very good, wine is a bit expensive. 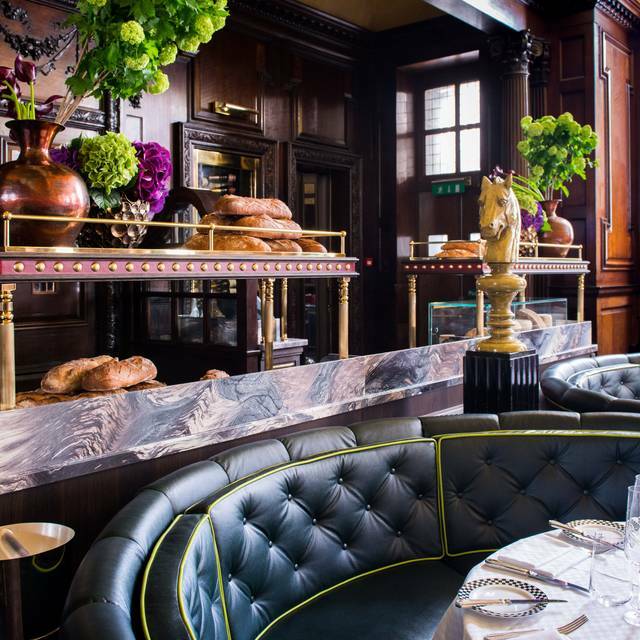 Overall an A for this traditional English Brasserie. We shall come back. 5 people went out for dinner Friday night (5th April) 4 of those people have been violently ill. The 5th person was also ill. The service charge also goes towards some of the staffs salaries. One group of employees receives a higher salary, so there for can’t access the tips (service charge) the remaindering staff members (as mentioned above) get paid a lower wage supplemented by the hard working general public who pay the service charge. This information was given by a member of staff. All very good. The only real criticism was the time it took to get the drinks in and it seemed a bit chaotic as to what had been ordered etc. I'm sure it would not have happened if Roy had been around (I know he's on leave). Everything else was fine and reception was, somewhat unusually, very efficient. The food was very good and the staff very pleasant. A classic that is as good now as ever. I do miss the upstairs dining room for ladies though. I loved the pale decor. The current restaurant is more gentleman's club. Each time we go to Simpson's the service, food and setting are excellent. My sister and I took out mother for mothers day on Sunday. The service was exceptional, the roast beef was delicious, the pianist created a lovely atmosphere and they gave my mum a nice pot of pink Rose's at the end of our meal which was a really nice touch. Great day out at Simpson’s for my father’s 70th birthday. The service was fantastic from the front desk, to the bar, and into the restaurant. The main course (beef from carving trolley) was fantastic, I honestly haven’t eaten better anywhere else. I felt the starters choice was slightly limited but I still found something and thouroughly enjoyed it. The drinks were good too and the bar staff were friendly, attentive, and knowledgeable. Hats off to all at Simpson’s, keep up the good work! Everything was superb, from the greeting at the door to the service; food was absolutely fantastic. The beef maybe the signature dish and is indeed superb but the steak pie is equally to die for. The staff were very attentive but not over-bearing and they really made a fuss of us, especially my wife as it was mothering Sunday and her birthday - so flowers and a mini desert with a candle were a real nice surprise. 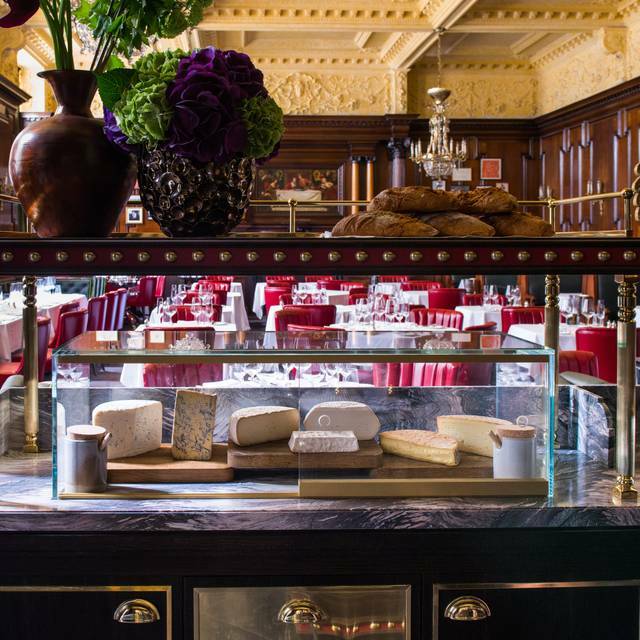 Having dinner at Simpson's In The Strand was one of the best dining experiences of my life. Being a longtime Sherlock Holmes fan, I was keen to visit one of the same restaurants as the Great Detective, and I was not disappointed. I had heard from previous reviews that the carving cart was the way to go, and I was extremely pleased with the selection of delicious beef I was presented with. Both mine and my wife's meal were excellent and the service was impeccable. I would definitely recommend Simpson's and I would love to visit again someday. We dropped in for some traditional English fare after a matinee show. The welcome and ambiance were spot on and the service we received was exemplary. The food represented the very best that anyone can experience and far outweighed our expectations. This is much more than just a 'roast dinner'. This is the 'roast dinner' taken to another level. Overall, our visit was outstanding and combined with the history of this place, makes for a must do London experience. Like going back in time,British old School, excellent service and food. We were offered the Churchill table which was absolutely lovely. The service was exemplary and only surpassed by the food quality . Very enjoyable evening. Wonderful way to celebrate a special event. First time back in 15 years. Still perfect.